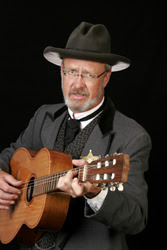 Gordy Pratt was the first presenter for the 2015-16 season of the Spearfish Area Historical Society with his performance of "SETH BULLOCK: The Spirit of the West". Over 125 people attended the Sept 1 program held at the Spearfish Senior Citizen Center. The enthusiastic audience gave Gordy Pratt a standing ovation. Afterwards, comments were heard of "great show", "very informative and fun" and "loved those coat-tails!". The program was sponsored in part by the South Dakota Humanities Council. Look on http://gordypratt.com/historic-show to learn more about this show.